NEW YORK—Fighting off Ebola was a costly endeavor. 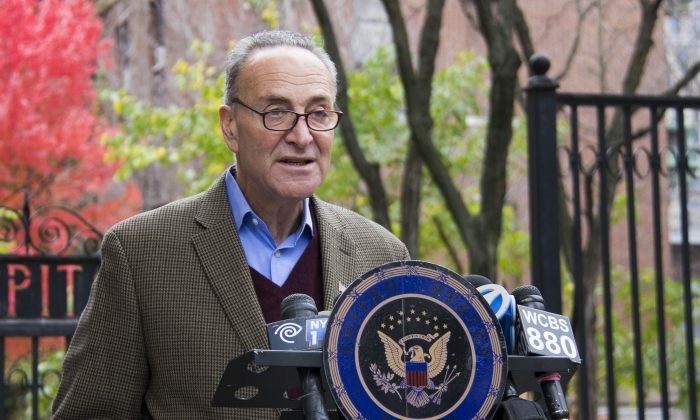 That’s why we should get the feds to reimburse us, argued Sen. Chuck Schumer Sunday. Schumer wants a $20 million cut out of the federal budget. It’ll pay for New York’s treatment of Dr. Craig Spencer as well as costs incurred tracking Spencer and those he contacted in the hours before he self-quarantined and later was diagnosed with Ebola. Although President Barack Obama has already requested $6.1 billion for dealing with Ebola, that plan does not include reimbursement and would only provide New York State with about $14.6 million. A large part of the $20 million would go toward cash-strapped Bellevue Hospital Center, where Spencer was treated and released from last Tuesday. About 100 workers treated Spencer, many of whom had to work overtime. They are also being monitored for potential symptoms of the disease . Travelers returning to the United States from the three Ebola ravaged West African countries are currently being funneled into five international airports, including New York’s John F. Kennedy International Airport. Under New York and New Jersey’s controversial mandatory quarantine policy, health officials are monitoring an additional 300 people who are either such travelers or have had contact with Spencer. Treating Ebola was a citywide effort that not only involved medical professionals, but also fire department workers, West African language translators, and disease detectives who investigated cases of Ebola, among others. In fact, New York has actually spent more than $20 million on Ebola so far, said Schumer, but government reimbursement usually only returns 90 percent of what was spent. “Local communities and local taxpayers should not foot the whole bill for handling an infectious disease that is a threat to the whole nation,” said Schumer, who compared Ebola to natural disasters. And Schumer is no stranger to the cause: he has championed other disaster recovery measures in the past, including resiliency funds after Superstorm Sandy and a bill to sue terrorist countries following 9/11. In addition to reimbursement, Schumer would also like to see a contingency fund be allocated in the budget, in case of future Ebola outbreaks in the United States. It would be modeled after the tuberculosis contingency fund, managed by the Centers for Disease Control and Prevention, which set aside $1 million in case of emergencies. The fund would compensate any city that handles a confirmed Ebola case—not just New York—treats the patient, and contains the threat. “These preparedness efforts are extremely costly,” said Greater New York Hospital Association President Kenneth Raske who stood outside Bellevue Hospital with Schumer at the Sunday press conference. “And there will continue to be significant Ebola costs moving forward,” he added. Schumer will be advocating for the money during the lame-duck Congress session for next year’s budget. He can only hope for Republicans to agree on it, he said, and a few might be moving to support him.